This doctored cake mix tres leches cake is originally from Recipezaar, and I’ve made it in a number of ways. Below is the usual version that calls for a 9×13 inch pan. However, the recipe can also be halved and baked in a smaller pan. The cake in the photo is half the recipe baked in a 9 inch round springform. Tip: To measure out half a box of cake mix, use your kitchen scale and weight out half the amount given on the box. 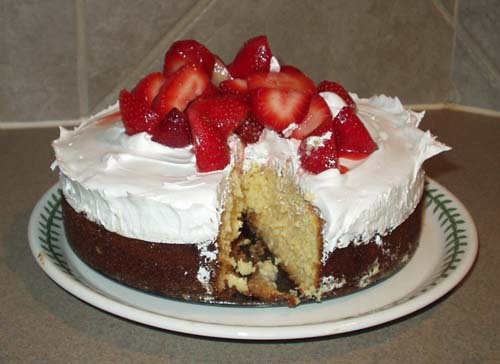 Cake Mix Tres Leches Cake is very good version of this South American classic. You can make the recipe as written or halve it and bake in an 8 inch square pan or round springform. Preheat oven to 350 degrees F. Grease a 13x9 inch pan or glass baking dish. Mix cake ingredients together. Beat two minutes on high. Pour into pan and bake at 350 degrees for 40-42 minutes or until a chopstick or skewer inserted in middle comes out clean. Let he cake cool for about 20 minutes. Mix together fillng ingredients. Use a chopstick or metal skewer to poke holes in cake. Pour filling into holes. Allow cake to cool a little more, then transfer to refrigerator to chill. Beat cream until almost stiff. Add sugar and vanilla and continute beating until peaks are stiff. Spread over cooled cake. Top with berries. This looks and sounds really good! I normally don’t use cake mixes, but I might have to try this. I want a tres leches cake for my birthday, so maybe I’ll make it this weekend. Thank you for the recipe! Thanks for the recipe! It turned out great! Anybody know a trick to make sure the middle is as moist as the edges? Another great recipe…..Ive tried this and its wonderful!! Easy to make and even easier to eat!! I thought the CAKE tasted outstanding….even though there was a hole in the middle. I think she used a 9″ pan and maybe it wasn’t thick enough to absorb all the milks. Everyone loved it though!!!! Sounds like she used a 9 inch pan. 9 inch is standard, but I just happened to have an 8 inch so I used that.If you double the recipe, you can make it in a 13×9 inch pan. My friend made this last night and it collapsed in the middle. She made it two times for our Bunco group tonight.. What could be wrong? Cookie Monster, I am really sorry to hear it didn’t work for your friend. I looked over the recipe and couldn’t find any errors in the ingredients. This is the cake I make all the time.Did you friend follow the directions exactly? I’m assuming she did, but I have to ask.It’s a half recipe, which means a half box of cake mix is involved. Did she measure out half of the cake mix? I do this by weighing it. Still, it’s cake mix so even if she’s off on that, it shouldn’t collapse! Could her baking powder be old? Congrats on the success – it looks great! You can almost taste it from the picture! Anna,I’m glad to hear the cake worked out. Hooray! It looks divine! That will be the next one I try on one of our “girls cooking nights”. Jeff and Maureen, I hope you try this one. It’s a recipe I’ll definitely be making again and one I’ll probably play with. I can imagine lots of variations. It’s not a light cake, but a small piece is moist and rich enough to satisfy and you can bulk it up with the fresh berries. Also, you can use plain old Cool Whip Lite or Cool Whip Free to save calories on the top layer.Kristin, glad you had it for breakfast. Hope you had some milk with that, young lady. Wow, that looks sooo good! Great job and great pic!